As the editor of The Horror Zine, I read a lot of horror. Now I am not complaining; I founded The Horror Zine because I love scary stuff and Twilight-Zone-type endings. 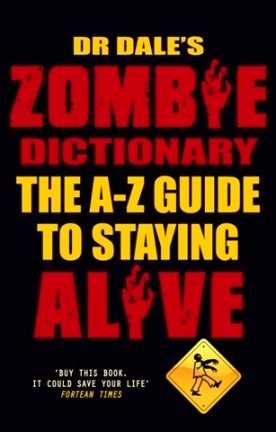 But still, it was a nice change when I was asked to review Dr. Dale’s Zombie Dictionary (The A-Z Guide to Staying Alive). It is a change for me because Dr. Dale’s Zombie Dictionary is not really horror; it is comedy. I figured that out when I got my first belly laugh from reading the back cover which states: Full money back guarantee offered should you die in a zombie apocalypse within 30 days of purchase. Once I saw that, I knew I was in for a treat. It gets even funnier from there. The very first sentence in the Introduction reads: Hi, I’m Dr. Dale from Dr. Dale’s School of Survival and I’ve written this book to make sure you don’t get your intestines ripped out. The Zombie Dictionary begins with the word AARDVARK and ends with the word ZOO. Why doesn’t it end with the word ZOMBIE, you ask? Because Dr. Dale thought that word was so important to this book (since they are the stars, so to speak) that he broke protocol and put the word ZOMBIE first. Each word is accompanied by an essay as to why this word can help you stay alive in the upcoming zombie apocalypse (everyone knows it is coming soon to a neighborhood near you). It is a tongue-in-cheek guide for all those who may have missed the movie Zombieland (to which the book makes a reference), or who have seen the movie Zombieland fifty times and it still is not enough zombie comedy for you. 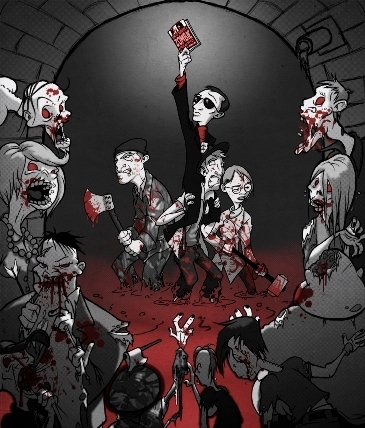 A movie is only two hours long, but you can have days of fun with the Zombie Dictionary. The British have a long-standing joke about folks from America being a bit kooky and ‘out there.’ So would any Brits care to explain why in September of 1977, the Carpenters song Calling Occupants of Interplanetary Craft only charted to number 31 in the USA whilst you took it all the way to number 9? Nine out of ten homeowners would prefer to die in their own houses than in their garage (the other one out of ten actually lived in his garage so the results there are a bit cloudy). Do not think of using a garden centre as your base of operations. The buildings are primarily made of glass. See the problem there? Yes, it would be a nightmare to keep clean. The internet will stay running for as long as you have electricity. Twitter will be an excellent way to find out if your loved ones and major celebrities are alive and well. We suggest updating your Twitter at least every three minutes with the statement ‘I’m still alive’ up until the point where you are not, because then of course it is no longer necessary. Necrophobia is the fear of death and dead things; hence, if you are afraid of zombies then you are a sufferer of necrophobia. Obviously you are not afraid of the dead or else you wouldn’t have bought this book—but you must be afraid of dying or else you wouldn’t have bought this book. 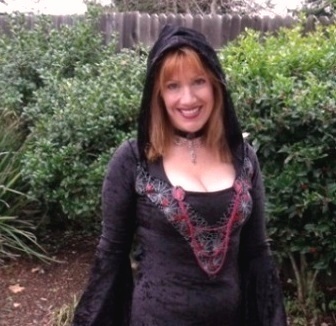 Technically, that would make you half a necrophobic—afraid of death but not of dead things—rophobic, if you will. So you see, the examples I have listed above are some of what you can expect from Dr. Dale’s Zombie Dictionary, who is really Dr. Dale Seslick, who is really really Ben Muir. And the book also contains zombie drawings by Jack Knight. Remember, this is not a novel but instead it is a book of survival essays. Most of these essays are very funny, some are lame, but all are entertaining. All in all, I do recommend this book because it feeds those who just cannot get enough of zombies and also because I gotta give Dr. Dale credit for thinking of this idea before I did. 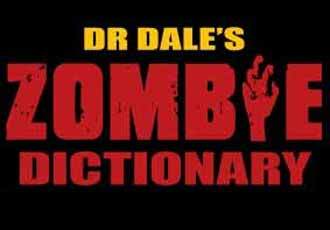 You can buy Dr. Dale's Zombie Dictionary HERE. Dr. Dale's (Ben Muir) first love has always been the theatre and he began writing scripts back in college whilst taking his Performing Arts Degree - after winning the UK Young Radio Playrights award in 1996 he went on to work freelance, scripting new drama for various theatre companies across the UK. 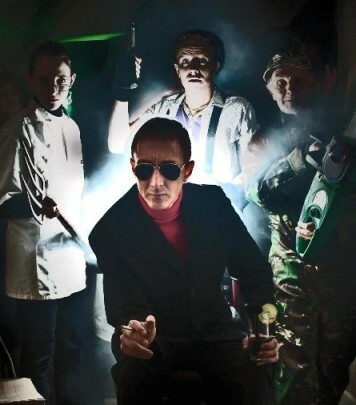 In 2003 Ben joined forces with some friends and formed After Dark Entertainments which presents interactive theatre shows based around his second love of all things murder, horror and geekdom. 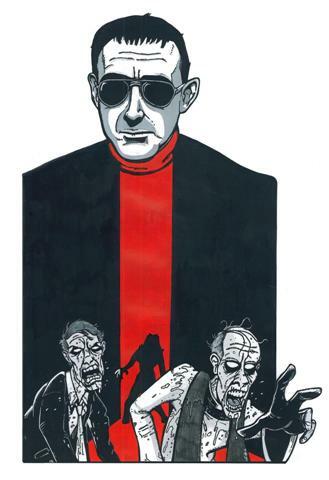 In 2009 they premiered 'How To Survive A Zombie Apocalypse' and the character of Dr Dale was born (alond with the other misfits at the School of Survival) and hence the tie in book was penned and released. Ben currently still works as a freelance playright and is working on his second book as we speak.